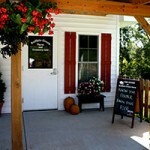 Buffalo Creek Farm and Creamery offers a little bit of everything. The farm store is quite well stocked with meats at all times including lamb, chicken, beef, goat cheese, eggs, and country store items from local artisans. Mother Holtz Farm will be offering seasonal produce in the parking lot on Sundays.